Starting in 1958, the US got involved in the military and economic assistance programs to Laos in the aftermath of the French war. On August 9, 1960 Kong Le staged a coup d’état to bring down Tiao Somsanith’s government that included Gen. Phoumi Nosavan as deputy-Prime Minister. The plotters asked Prince Souvanna Phouma, who had just started his term as Laos Ambassador to France, to come back and form a new government. Kong Le used a helicopter to fly to Muang Kasy and bring back the Pathet Lao leaders that ran away from jail a while ago so they could be part of the Souvanna’s cabinet. Those leaders included Nouhak Phoumsavan, Phoune Sipraseuth, Sisana Sisan, Singkapo Sikhot Chounlamany, and Phoumi Vongvichit. Most of the Lao people were hoping and thought that Prince Souvanna Phouma’s neutral government was going to seek assistance from France. They were disappointed because the Coup’s leaders joined hands with the Pathet Lao and the communist world instead, thereby flooding Vientiane with North-Vietnamese troops. Only a few days after the coup d’état, the deputy commander of the Plain of Jar airbase working under Maj. Vang Pao tried to assassinate his boss one night but Maj. Vang Pao managed to escape safely. It was possible that this assassination attempt might have been ordered by the Coup leaders in Vientiane. This incident might have a role in Maj. Vang Pao’s decision to fight Prince Souvanna Phouma’s neutralism. About one week later, Maj. Vang Pao was able to mobilize his troops and retake control of the Plain of Jars. A few days later, Prince Souvanna Phouma sent Gen. Amkha Soukhavong to Xieng Khouang to collect rice to feed communist troops stationed in Vientiane. Maj. Vang Pao captured Gen. Amkha and delivered him to the Counter-Coup leaders in Savannakhet. Prince Souvanna Phouma then sent Touby Lyfoung as the government’s Minister of Justice to Xieng Khouang to pacify the population and advice them to stay put. Maj. Vang Pao detained Touby Lyfoung to prevent him for collaborating further with Prince Souvanna Phouma’s government. 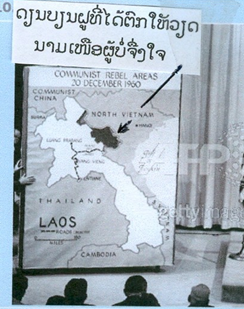 On September 10, 1960 Gen. Phoumi Nosavan announced the formation of a Counter-Coup d’état group in Savannakhet, under the leadership of Prince Boun-Oum Na Champassack with the goal of liberating Vientiane from the Kong Le’s Coup d’état group. On December 8, 1960 Col. Kouprasith Abhay, commander of Military Region II led his troops to retake Vientiane but without success because the coup d’état group had the support of the North-Vietnamese troops. [Before 1962, there was no Military Region V, just four military regions. Xieng Khouang, Samneua and Vientiane Provinces were part of Military Region II]. These developments forced Prince Souvanna Phouma to fly out to and seek refuge in Phnom-Penh, Cambodia where he stayed for a couple of months. On February 11, 1961 the Prince flew to Xieng Khouang to join Capt. Kong Le and the North-Vietnamese troops who had already occupied the Plain of Jars on December 31, 1960 and used it as their stronghold. On December 13, 1960 the first airborne battalion parachuted at Tha Na Leng, near Tha Deua, joined forces with Military Region II (MR-II) troops in Chi Nai Mo, and moved in to fight the troops of Kong Le’s coup d’état. Several battalions of ground forces of the Savannakhet Counter-Coup d’état group made their way from Savannakhet along Highway 13 from Paksane to Vientiane. This was to reinforce MR-II’s troops and the first airborne battalion who were fighting the Coup d’état battalion and the North-Vietnamese troops in Vientiane. December 16, 1960 was the last day of fight between the two adversaries, the day Vientiane was liberated from the coup d’état troops. Kong Le retreated from Vientiane along Highway 13 to Sala Phou Khoune. Phoumi Vongvichit in his memoirs wrote, “We did not want to fight in Vientiane because of the risk of inflicting too much damage to the residents and the city. So we decided to take the Plain of Jars and continue our fight from there.” The Pathet Lao troops were waiting for Kong Le’s troops in Vang Vieng. Upon Kong Le’s arrival, North-Vietnamese airplanes dropped arms, ammunitions, and food supplies to Kong Le’s troops, along with canons, light tanks, and hand guns. Kong Le moved his troops toward Muang Kasy, Sala Phou Khoune and then took over the Muang Soui’s airbase in Xieng Khouang Province on December 25, 1960. The third contingent consisting of Kong Le’s and Lao communist troops moved from Muang Soui to Ban Bane. After they took over Ban Bane, Kong Le and North-Vietnamese troops moved next toward the Plain of Jars. The troops that took Muang Soui were deployed, along with light tanks, to guard the steel bridge over the Nam Ngum River on the highway leading to the Plain of Jars. The North-Vietnamese used several hundreds of Russian Ilyushin aircrafts to fly in to Muang Soui from dawn to dusk –two planes at a time– to drop off all kinds of arms and ammunitions to Kong Le. Some of the planes even landed in Muang Soui. The air supply operation last only four days. Kong Le then attacked the Plain of Jars with that tremendous assistance from the communist world designed to wipe out the entire Lao population. On December 29, 1960 Gen. Phoumi Nosavan deployed one airborne battalion to reinforce Maj. Vang Pao’s troops –about one battalion strong stationed in the Plain of Jars—to help defend the Plain of Jars against North-Vietnamese and Kong Le troops. As the allies’ troops set foot on the Nam Ngum River steel bridge, they were immediately surrounded by the enemy who fired 12.8 mm and 14.6 mm guns from their light tanks. Several allied troopers were killed on the spot, and some of them had to jump to their death from the bridge. Officer Nao Her Vang reported later that it was really scary and extremely demoralizing to hear the thundering noise of the big guns. Photo #38. Maj. Vang Pao (left hand resting on his belt) shown with many Hmong leaders, ready to retake the Plain of Jars airport. Photo taken in 1960. Col. Tou Lu Mua was shown with both hands on his belt. 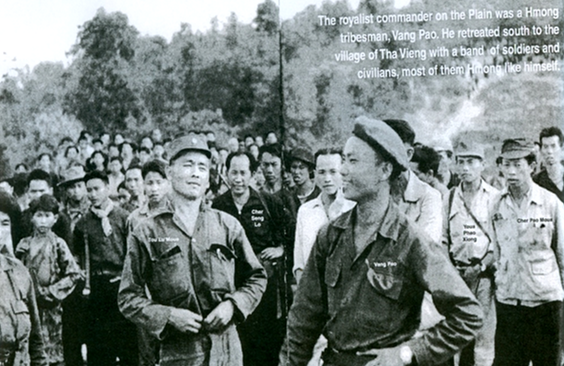 Col. Song Leng Song and Col. Cher Pao Mua, Bouam Louang commander are shown to the right of Maj. Vang Pao. The 105 mm machine gun squads that accompanied Gen. Phoumi Nosavan’s airborne reinforcement battalion did not even have the time to line up their weapons. Instead, they had to leave almost everything behind at the last second. On December 31, 1960 the airbase at the Plain of Jars and the town of Xieng Khouang were entirely in the hands of the enemy. The troops of Maj. Vang Pao and Gen. Phoumi Nosavan retreated on wheels toward Xieng Khouang, abandoned their vehicles around Ban Sam Khone, south of Xieng Khouang, and continued on foot toward Tha Vieng and Tha Thom. At that point, Maj. Vang Pao flew in on helicopter and met with Gen. Phoumi Nosavan. He also had a chance to run into US Agent James W. Lair who was responsible for the US military assistance to Laos until 1967. [This job was next handled by Pat Landry, until 1969, and by Jerry Daniels until 1975. Later on, during 1975-1982, the job covered refugee resettlement in Thailand]. The US set up intelligence units and put in place defensive plans for the northern part of Laos (Phonsaly) and Houaphan Province, prompting Red China to heavily attack the Nam Bak camp in 1962. The US then decided to set up an Air Forces base in Thailand. As the military situation intensified, North-Vietnam deployed troops into South-Vietnam in 1963. Once the US decided to put South-Vietnam under Ngo-Dinh-Diem, the Vietnam War erupted. Maj. Vang Pao was the first Hmong officer of the Royal Lao Army to be promoted to the rank of Lieutenant-Colonel. In 1962, he was a full Colonel and the commander of Military Region II (which covered Houaphan and Xieng Khouang Provinces). Please refer to Gen. Vang Pao’ biography in Chapter 20. Between 1961 and 1965, several Red Lao soldiers deserted their units to join Gen. Vang Pao, after realizing that the Red Lao were dictatorial and were simply serving North-Vietnam’s causes. During that time, there were no less than 40 Vietnamese battalions in Laos, compared to less than 50 Lao battalions. (Each of the military regions had no more than 10,000 soldiers, and there were only four of them. Also, the defense budget was very limited. The first US Agent who came in to help provide military assistance to Military Region II was James W. Lair. The US Ambassador was then William Sullivan]. In 1961, Touby Lyfoung lived in Savannakhet following his detention by Maj. Vang Pao in Xieng Khouang. He later had the opportunity to go back to Vientiane to join Prince Boum Oum’s government (as the Minister of Social Welfare and Public Health). North and northwestern regions (LS05): Bouam Long Camp (LS32). Col. Cheupao Moua was the commander of this 12,000 soldier camp that had never been occupied even once by the enemy during 1961-1975. But, in the end, this camp fell to the communists once the US pulled out of Indochina. Those living in this camp suffered extremely heavy losses. Phou Saboth Camp (the birthplace of Col. Nhia Lue Vang and Lt. Col. Vang Koua) under the command of Col. Nhia Lue Vang. In 1969, this base was heavily attacked by the enemy as it was located near the Laos/North-Vietnam, near Samneua, the headquarters of the Lao Communists. San Tior Camp (LS02), located mid-way between Xieng Khouang and Nonghet, has always been a critical obstacle for the enemy that used Highway 7 between the Plain of Jars and North-Vietnam. This base has been very effective in controlling enemy movements and was the main target for the enemy before 1969. The allied forces lost an important military officer, Lt. Col. Lysao, the younger brother of Col. Ly Tou Pao. In the beginning of 1970, all the military bases in the northern part of MR-II fell in the hands of the North-Vietnamese communists. Seventy percent of the total MR-II land-area was lost, including the entire Houaphan Province. Muang Mork Camp (LS46), an important base for the defense of MR-II and MR-V, was equipped with several tens of thousands of military and civilian personnel. This camp had been heavily attacked and occupied several times by the enemy, but was taken back each time. The allied troops were stationed here until 1975 before retreating in the jungle, following the US cut in military assistance. Its commander, Col. Chong Koua Vue did not have a chance to leave the country and was killed in the Laos jungle in 1981. Muang Mork Camp was surrounded by three supporting camps –Khay Ampeu, Khay Meh, and Khay Phou Louang Noi. Phou Ka Bork Camp, located on top of the highest mountain range close to the town of Xieng Khouang, created a lot of danger to the enemy operating around Xieng Khouang. It was heavily attacked by artillery and rockets and fell to the enemy in 1968. The many changes that took place in South-east Asia (including the China war, the Korean War, the Indochina War, the fall of Dien-Bien-Phu and the Kong Le’s coup d’état) had caused concerns to the US. 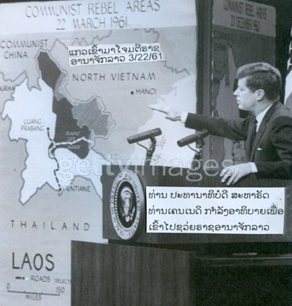 President Kennedy, who took office on January 21, 1961 decided to provide military assistance to Laos in 1961 and to South-Vietnam in 1963 to limit communist extension. He believed Ho-Chi-Minh did not comply with the agreement on Dien-Bien-Phu reached under the Geneva Accord of 1954. During 1961-1964, the US was interested in setting up intelligence teams to monitor the enemy’s mouvements in northern Laos (Phonsaly and Houaphan Provinces) as Priority One and Xieng Khounag Province as Priority Two. The US helped the Royal Lao Government establish a military camp at Nam Bark, Phongsaly Province and several other sites in Houaphan Province. On September 27, 1962 following the creation of the Laos Tri-Party Government, US Ambassador Leonard Unger paid visit to the Kong Le’s forces at the Plain of Jars. On November 22, 1962 the US provided supplies and equipment to the Neutralist Army by plane. This created a problem that caused Col. Deuane Sounnarath, an avid communist follower, to dislike and disagree with the US assistance. Col. Deuane led neutralist forces under his command and North-Vietnamese troops to attack the smaller Kong Le’s forces that had to retreat to Muang Phann on June 4, 1963. On October 4, 1963 the US increased its airborne assistance to Kong Le and Gen. Vang Pao in the fight against communist North-Vietnam. The US also provided T-28 pilot training and several T-28 aircrafts to the Royal Lao Government. On February 27, 1963 King Sisavang Vatthana and the Royal Lao Government, which proclaimed itself as being neutral, paid visit to the US and listened to US President Kennedy’s briefings. The US became involved in the war that broke up in Laos and South-Vietnam in the beginning of 1963 and last until 1975. In the end, the parties that joined forces with the US suffered heavy losses because of the cut in US assistance in the final phases of the conflict. Photo #39 US President Kennedy explained that the fall of Dien-Bien-Phu was a great concern to the US and led to the Vietnam War. Photo #40 US President Kennedy went over the various events that happened in Laos as a result of the Vietnamese violations of the previously signed agreements. Photo #41. 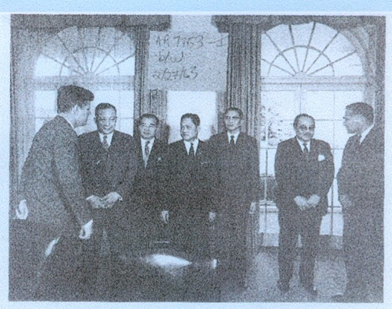 US President Kennedy invited the Lao King and members of his neutralist government to pay visit to the USA on February 27, 1963. After the visit, the Vietnam War broke out on March 2, 1963 and last until May 1975. From left to right: Pres. Kennedy, King Savang Vattana, Tiao Souvanna Phouma, Ngone Sananikoke, Phoumi Vongvichit, and other guests.